Braces Now Vs. 30 Years Ago: What's The Difference? Braces Now vs. 30 Years Ago: What’s The Difference? We meet people every day who had braces when they were younger, and due to various reasons, are now getting braces again as an adult. After seeing examples of braces used today, we often hear, “braces have changed so much!” The pictures below illustrate the differences between the types of braces used in the 1980s and those used today. The braces that Dr. Peralta uses are less visible because they are made of a “clear”, ceramic material and are significantly smaller in size. Because of their smaller size, they are also more comfortable because the mouth does not need to adapt to as much foreign material. The advanced materials used today allow the braces to move the teeth more quickly and precisely than they did 30 years ago. 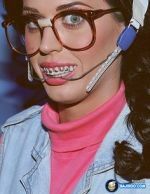 After the removal of the braces/bands in the 1980s, it would take additional time for the gaps between the teeth to close. It is for this reason that today’s braces allow for more precise final results! If you’re an adult who has questions about braces or would like more information on how our Seattle orthodontist can help you, give our office a call and we will be happy to help you out!